A pair of interesting patent applications from Apple were published today by the U.S. Patent and Trademark Office revealing concepts Apple engineers have been tossing around as they work to develop features for future products. Unwired View points to an application entitled "Seamlessly Embedded Heart Rate Monitor", and while some might assume that Apple is looking to build new Nike+ capabilities into its mobile devices, the company's focus on this technology actually appears to be related to biometric identification of users. To determine the user's heart rate, heartbeat, or other cardiac signals, the electronic device can include one or more sensors embedded in the device. The one or more sensors can include leads for receiving electrical signals from the user's heart. . . . To provide an electrical signal from the user to the processing circuitry, the leads can be exposed such that the user may directly contact the leads, or may instead or in addition be coupled to an electrically conductive portion of the device enclosure (e.g., a metallic bezel or housing forming the exterior of the device). In particular, Apple envisions the use of heartbeat signals either for authenticating a user for access to the device's content or for identifying the user and loading a customized profile utilizing their preset preferences for the device. 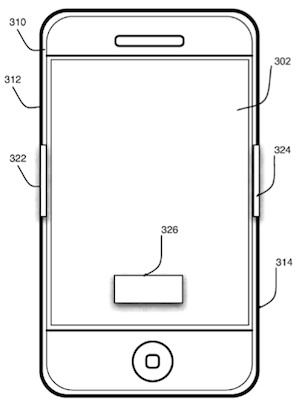 A second patent application, entitled "Multidimensional Widgets", demonstrates Apple's research into offering Dashboard widgets with multiple sides, allowing users to rotate them in virtual three dimensions to present different data or functionality and reduce visual clutter. As an example, Apple describes a stock ticker widget where a user can define each side of a three-dimensional widget to contain detailed financial information on a single stock. The widget could adapt in shape to the number of entries made by the user, expanding or contracting based on additions or subtractions. For example, a three-dimensional widget with four or fewer functions can be of the form of a tetrahedron; a three-dimensional widget with five or six functions can be of the form of a hexahedron; a three-dimensional widget with seven or eight functions can be of the form of a octahedron; and a three-dimensional widget with nine functions can be of the form of a dodecahedron. Thus, if a user specifies ten stock tickers for quotes and technicals, the widget 420 can expand from a hexahedron to a dodecahedron. Apple also describes a "widget receptacle", where multiple 3D widgets could be grouped together based on certain criteria and represented on a single larger 3D surface. Upon activation of one of the faces of the receptacle, the corresponding widget would be instantiated on its own. Apple has explored other virtual multidimensional interface environments in previous patent applications, including on an iPhone-like mobile device and in a 3D desktop similar to that used by BumpTop, which was recently acquired by Google.